I'm not particularly an Eggers fan, or particularly not. I don't follow his work per se, though I dip into the McSweeney's site every now and again. Some of the stuff's snort-inducing hilarious, some scratch my head "Huh?" But it's true I simply do not understand humor of a certain variety. It's very pop culture-y, 30-something or whatnot and makes my head hurt. Most of the site's not like that but other parts evoke my fight or flight response. It's inexplicable but I know it when it scares me. I also have the distinction of owning a copy of Zeitoun I picked up when one of my local Borders stores bought the farm. It's about New Orleans, I'm a southerner and Katrina's wrath hit me like a punch in the stomach for its initial devastation, mind-blowing aftermath and the egregious immorality of the government's response to extend aid to the people. Or lack of response, I should say. 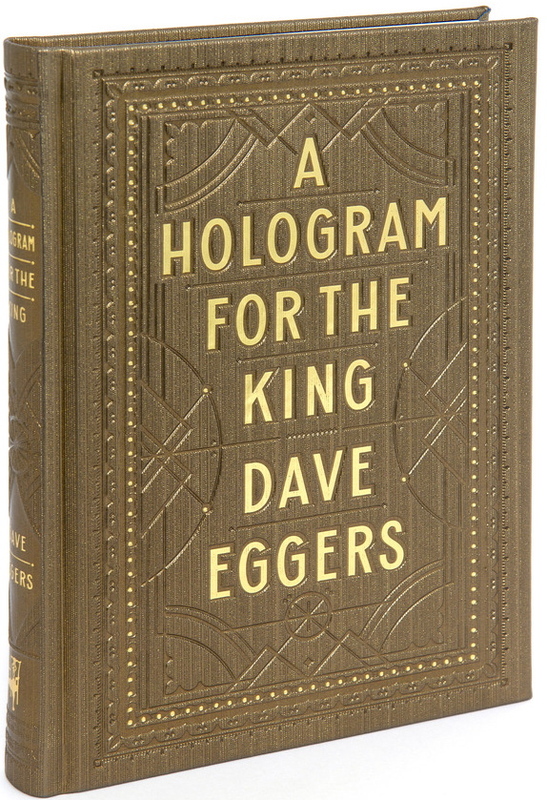 But I haven't actually read it yet, so Hologram for the King's my first experience with his fiction, though I've read a few stray columns of his. I don't even know why I read it. Nothing about Saudi Arabia appeals to me. Nothing about any place that's hotter than Hades appeals to me. Oh, wait. NOLA. But that's the South and I already mentioned I'm southern. We don't need to go back through that again. How did it go? Very quickly, actually. Very readable, as the critics say: a backhanded compliment if ever I heard one, next to "The font was exquisite!" I liked main character Alan Clay immediately, partly because life likes to mess with him in major bummer ways so I think we could be related. (And since I'm southern, I could marry him, too. Rim shot.) Only, Alan maintains his center, his inner optimist, whereas I'd have taken the next damn flight out of the place before you could say "oil reserves." Alan's a businessman who spends most of the book waiting to pitch his company's technology to the king of Saudi Arabia, for use in advertising and supporting the king's long-stalled project to build a new super-city/community – basically, it's acres and acres of sand sitting on prime seaside real estate, with only a couple finished and half-finished buildings to show for itself after sitting there for a couple of years. Only, the king is never in the country. Nor does anyone volunteer any information about the king's whereabouts – at least none that sounds honest or vaguely plausible. Worse yet, he and his three-person crew are relegated to a tent – not the air conditioned building within sight of them – with failing a/c and wi-fi that dies a swift death the first day they're there. So, they're a tech company that can't access their own technology, sweating away in a tent with barely any moving air, no food and no way to get back to their hotel until the hotel's evening shuttle bus comes back to retrieve them. For week after week after week. But they can't not be there because no one knows when the king will show up. If he shows up and they're not there? Sometimes, my friend, there are no second chances. I'm telling you. Next plane out if it were me. Alan, justifiably frustrated, starts branching out, meeting some of the locals and other foreigners, building relationships. One of his new acquaintances is a driver named Yousef, a young man who receives racy text messages from another man's wife. Another man who keeps threatening Yousef's life, to the extent he has to check under the hood of his car for a bomb before he dares start it. And this is the driver Alan hires, because he sleeps too late to make the morning hotel shuttle out to the tent with the rest of his co-workers. Alan's perfectly aware of the danger, so why? Why? Why? Because Yousef's funny, personable, speaks English and is fun to be with. Plus, he's a local and can more easily decode the nonsense the Saudis are trying to feed him. And Alan has a few… Issues. In the midst of all this, Alan has discovered a growth on the back of his neck. A large growth he's convinced has fused to his spinal cord and will kill him. So there's that, as well as his young adult daughter back, home who's wavering on the brink of not being able to afford her next year of college, her future totally up in the air. And Alan's ex-wife, Ruby, is less than no help at all. Get the feeling this is one of those multi-plotline books? Because yes. Yes, it is. And a grand one, too. It's a romp, a crazy madhouse wild ride through Saudi Arabia, of all places. But it's not all comic, by any means. Darkly funny, yes, but Eggers goes into a lot of detail about the sad state of the world, as well as Alan's own multi-faceted mid-life crisis, which I can pretty much guarantee will be unlike any other you'll encounter in fiction. If you've made any sense out of this at all I'll frankly be shocked but let me give you one little piece of advice: read it. It's good.